Ben Bernanke is famous as the originator of the theory of the “global savings glut” as a partial explanation for the previous decade’s1 housing bubble, and in his speech yesterday at the American Economic Association he put up this chart to demonstrate his point. Basically, it shows that big current account deficits are moderately correlated with housing bubbles in various countries around the world. Spain, Britain, and the United States ran big deficits, which means that lots of overseas money was flowing in and helping to finance a boom. Germany and Switzerland ran big surpluses, which means that money was flowing out and housing prices stayed fairly flat. That’s only part of the story, of course, but it’s always struck me as an important part. If huge amounts of cheap money are flowing into an economy, then all the rules in the world aren’t going to stop it from inflating something, and housing is always a good candidate. At the same time, it’s also incomplete. 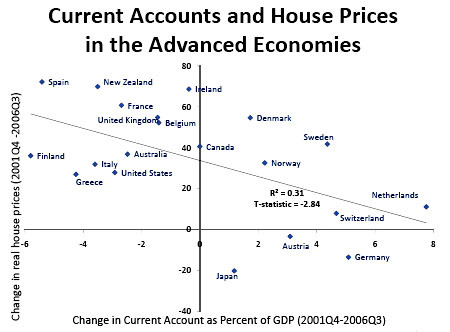 Ireland ran a mostly balanced current account and suffered one of the biggest housing bubbles anyway. What’s more, in a sense it doesn’t matter as much as it once did since this kind of contagion spreads so fast now. Germany may have run current account surpluses, but its banks bought up plenty of American mortgage securities and insured them using credit default swaps from American insurance companies, so when the bubble burst they were hurt every bit as badly as we were. And of course, although rules can’t stop hot money from inflating assets completely, they can moderate its effect. As Paul Krugman says: “Bernanke should have been more forthright about the Fed’s undoubted failures: Greenspan’s rejection of advice about the risks of subprime lending, and the failure of top officials, BB included, to recognize the housing bubble in real time.” America needs to get its long-term trade deficit under control, but we also need to get a whole lot more serious about regulating leverage throughout the entire economic system in simple and transparent ways. These aren’t competing goals, they’re complementary ones. 1Isn’t it nice to finally be able to refer to this cleanly as the “previous decade”?